I'm seeing posts about inverted yield curves. There are some theories that they can predict that a recession is imminent. So I decided to looked at the yield curve prior to the last recession, a.k.a The Great Recession. According to NBER, the last recession started in Dec-2007 and ended Jun-2009. The contraction, from peak to trough, lasted 18 months. The prior expansion lasted 73 months. I downloaded Daily Treasury Yield Curve Rates for 2005-08 and Effective Federal Funds Rate (FEDFUNDS). Then I computed the deltas across the yield curve. Usually, the yield curve is rising and the deltas are positive. Negative deltas indicate some inversion. The numbers are in basis points (bps) which is 1/100 of 1 percent or parts per 10,000. First, I will mention that the Fed started raising the FFR starting about Jun-2004 and it was immediately higher than the 1-Month Treasury. So the delta 1M-FFR was negative for most days from 2004 (not shown) until 2008. So I would not focus so much on the first column, I only included it for completeness. Except for 1M-FFR, the rest of the deltas were positive double digit bps for all of 2004 (not shown) and most of 2005. I would call this a normal, non-inverted yield curve. However, the deltas were getting smaller for most of 2005, i.e. flattening yield curve. On Feb 9, 2006, they added a 30-year Treasury bond, which immediately had a lower yield than the 20-year bond by about 20 bps. Very strange! Through Jun-2006 small negative deltas. Second half of 2006 started to see double digit negative deltas, especially 2Y-1Y. By Jan-2007, 2Y-1Y was -24bps, and the rest of the yield curve was turning red (negative delta). By Mar-2007, 2Y-Y was -36 bps and double digit red up to 5 year. During May-2007, the yield curve became less inverted. 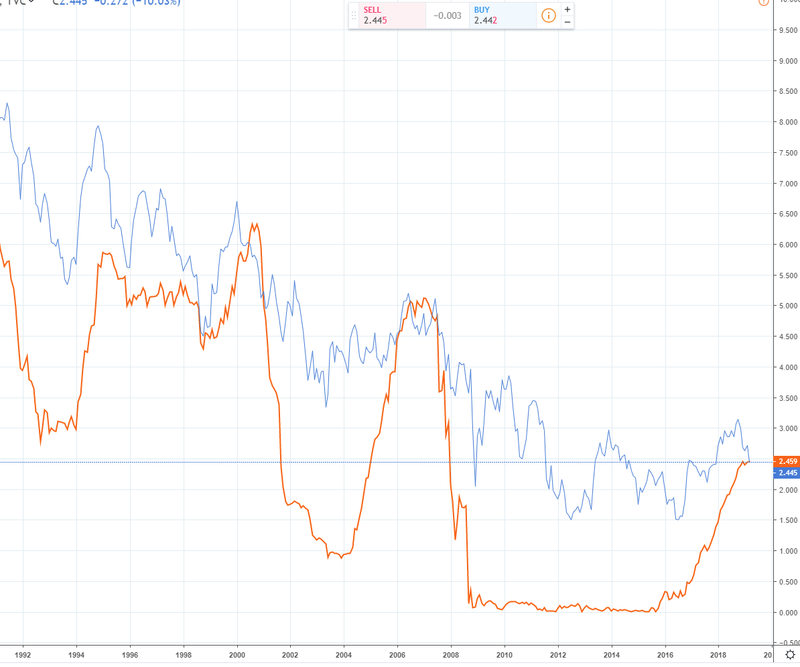 By Jun-2007, there was no longer inverted. For a short time. Then the yield curve started inverting again, and by Aug-2007, the 2Y-1Y was back to -30 bps. The curve stayed slightly inverted right through the official beginning of the recession in Dec-2017. Summary: The recession officially started in Dec-2007, but the yield curve first showed small signs of inversion in Nov-2005, about two years earlier. Greater amount of inversion didn't appear until about Jun-2006, about 1-1/2 years prior to the recession start. Greatest amount of inversion was about Mar-2007, 9 months before the recession start. Lesson: If yield curve does foreshadow a recession, it would start showing inversion about 1-1/2 to 2 years beforehand. I wonder how well an inverted yield curve foreshadowed other recessions. And whether this effect was similar in other nations. When the 10-2 or 10-1 goes negative, we could say that the yield curve is inverted. We can see that it does tend to go negative before recessions, but there also are some false alarms, and the timing is not consistent. Thanks. It's an interesting post. It appears that an inverted yield curve has been a good precursor to recessions going back at least 40 years, albeit with a lag time between inversion and the beginning of the recession ranging from 10-24 months, during which time markets generally did quite well. But this effect has been stronger in the U.S. than in most other nations. Starting in Jan-2017, each delta was positive double digits. Normal monotonically increasing yield curve. About late Jun-2017, 6M-3M went slightly negative for a few days, but then back to normal. After that, the yield curve has been normal, but the deltas did become smaller (slightly flatter). About Dec-2017, the 10M-7M go to single-digit positive. But no actual inversion for the past year or so. Summary: The Yield Curve is not inverted at this time. Yield curve has flattened over the past few months. Conclusion: Articles and posts about Yield Curve inversion are pre-maturing. It hasn't inverted. It has only got flatten, so it's not as steep. And if 2007 Recession is a guide, a recession won't start for about 1-1/2 - 2 years once it does show inversion. That measure also shows not inverted at this time. And there is a long lag in each case. If an inverted yield has a causal effect on recession, it seems that the inversion must be prolonged for whatever economic effect it is having to work. And then the effect shows up a year or two later as a recession. I will also point out that at the official start of the recession Dec-2007, most people were not aware that a recession started. I recall a few doom-and-gloomers who always think a recession is coming, but no-one else. I recall it took many months before everyone agreed that there was a recession. If they are predicting a recession by end of 2020, that is 2-1/2 years out. The yield curve needs to start inverting soon to meet their schedule. We can see that it does tend to go negative before recessions, but there also are some false alarms, and the timing is not consistent. With the 10-2, I'm not seeing any false alarms, only variable time until the recession started. Yeah, I was looking at the 10-1 for the false alarm. More history, more data points to consider. Added: Trying to read. I'm not making any sense of it. Also downloaded the Excel file. Cannot open on my computer with Libre Office. 110 Mb. Too big? The data also is in a set of 30 html pages/tables, with about two years of data in each table. The most recent data, from 1/10/2017 through 7/20/2018 (as of today), is here: http://www.federalreserve.gov/econresda ... 28_30.html. Note that the URL is the same for each page except for the page number at the end. Only takes a few seconds to load one of the tables. For tables 1-29, which now are static, you could copy/paste-values once you've imported it, so you don't have to import it each time. You still might have some size problems if trying to work with all the data. Another approach is to just save the BETAs and TAUs, which takes up much less space, and then use the formulas in the paper to calculate the values you're interested in. If you believe that indicator. Recessions are no longer caused by Fed tightening. That was not the key factor in 2000-03 nor in 2007-8. We seem to be back to a 19th century model, where the economy and financial markets run under their own steam, and recessions, and depressions, are caused by excessive speculation and when they just run out of steam. Schumpeterian cycles of creation and destruction, if you will. Our hand on the throttle of the economy is no longer so sure. See Japan since 1990. Yes there were policy mistakes, particularly by the Bank of Japan in the 1990s. But greater stimulation since has not been able to overcome the natural forces of the economy. If the US or the world economy hit recessions now, then monetary policy will have little purchase on the problem. Interest rates are too close to zero to have a lot of impact. Is the NBER definition at the end of the two negative qtrs of GDP? I'm wondering if you should backdate the recession to the beginning month of the first two negative qtrs of the last recession (i.e. Jun 2007) and narrow the gap somewhat between a bond yield inversion and a recession begins. I think that the two quarters of negative GDP is just a rule-of-thumb used by some, but not necessarily by NBER. and the period from a trough to a peak is an expansion. NBER tries the best to pinpoint the start of the recession, which is the previous peak. So there should be no reason to adjust their dates. My take away is that we are not yet close to inversion (which differs from what the media would have us believe). The Federal Open Market Committee votes unanimously to keep the target range for its benchmark rate at 1.75 percent to 2 percent. The Yield curve is still not inverted. The next meeting is Sep 26, 2018. Right now 91.2% chance the rate will be raised to 200-225 at the next meeting. Interesting. Is the data for a global yield curve easily available? In the article Fisher states he constructs it using the 3 mo v 10 yr country by country overlayed with weightings based on MSCI World ratios. I suppose one could build a google xsheet if they wanted to monitor this themselves in real time. I don't, I figure he'll announce when his tracking shows global to invert. Update: 12/5/2018 5 months later. FFR = 2.20%. They also added 8-week Treasury (2M) on 10/16/2018. With the 5Y is less than the 3Y, the Yield Curve is no longer monotonically increasing. Whether or not it is called Inverted Yield Curve depends on your definition. Some define Inverted when 10Y - 2Y is negative. Right now is +11 bps. So not inverted by that definition. However, the average 10Y - 2Y was 93 during 2017 so its a lot closer to being inverted. Next FOMC meeting is Dec 19, 2018. 79% chance of raising to 2.25 - 2.50. Everything is going according to plan. Recession scheduled for Dec-2020. I think the 10-2 is something to keep an eye on. If for no other reason than to have something to talk about on the fora. If the Fed raises rates this year, IMHO they will ensure a recession by 2020. If they don't, I think they will ensure a recession. Either way, we get a recession. I don't think the inverted yield curve is AS important this time, mainly due to the Fed balance sheet holding down the long end. What is more important is simply interest rates across the board, and whether the Fed hikes once more, twice more, or stops, its current QT program will cause a collapse in asset prices. That loud sucking noise you hear is 50 billion a month of blood being drawn out of the zombie patient we call the markets. Get ready for Fed cuts, QE4eva, and a little taste of NIRP. I agree that 2000 was caused by excessive speculation by investors. But I haven’t studied that one in detail. However, 2008 was caused by excessive speculation due to proper lack of oversight by the credit bureaus and the deregulation of by banks (whereby they were allowed to become too big to fail, and allowed to take on too much risk, and did not need to undergo proper tests/checks). Basically if you have no regulation, and no Federal Reserve, then we are back to the 19th century laissez-faire economy. With the Federal Reserve and the proper amount of regulation, the economy will be optimal, people will propser and our environment will be conserved. On the other hand, if there is too much regulation, that will hinder the economy. So it’s all about striking a balance, which few people seem to understand. It’s always easier to just pick being on one side or the other. It seems almost like a tautology. 100% of the time, stock market crashes are preceded by stocks going up. We know the Fed lowers rates to stimulate the economy, then raises rates to control inflation. When rates are increasing, the curve inverts. At some point there will be a recession and rates will drop. I wonder what the results would be if you cashed out the day of yield curve inversion and then DCA back in over X years. Would the yield curve timer outperform a buy and hold investor? I haven't heard of a 'Fed driven strategy' that even backtested well. But perhaps there is one out there that would actually work going forward. This is the Fed's quarterly financial report from September. Table 2 (labeled "Domestic SOMA portfolio holdings") shows a breakdown of treasuries holdings in terms of bills, notes, and bonds. But does anybody know if there's a place that shows the maturities of their holdings within those categories? But does anybody know if there's a place that shows the maturities of their holdings within those categories? First, Jeremy Siegel devotes a full chapter of Stocks for the Long Run to the business cycle, and shows that even though the stock market has a causal connection with, and an obvious correlation with the business cycle, nevertheless market timing backtesting based on the NBER dates of recessions hardly works at all. Siegel found that an investor that (magically) knew NBER recession dates as they occurred--rather than when the NBER announces them after the recession is over--could only improve return by 1/2%. Thus, even if the yield curve reliably predicted recessions, that does not mean that you could use its predictions as market timing signals to improve stock market investment returns. It seems bizarre to suppose that knowing a crash in advance wouldn't help, but it's quite possible. To be accurate, a prediction must be reliable both ways, and reasonably precise in timing. Also, per this author, 2/10 yr. inversion has correctly saged a recession 7 times in a row since 1969. 1) I don't think this can be repeated often enough: predicting a recession is not predicting the stock market, and correctly predicting a recession would not necessarily beat buy-and-hold. Jeremy Siegel devotes a full chapter of Stocks for the Long Run to this very case, and found that even market timing on exact recession starting and ending dates--which is impossible since the NBER does not announce them until after the recession is over--would give you only an 0.5% improvement over simply buying and holding. 2) Knowing "the best investments in case of X" is useless and a mental trap. By the time you know that X is actually occurring, it's too late to buy those investments, and before it occurs you're relying on predictions. I believe salesmen use this trap intentionally. The sales pitch is to feign great interest in your wise and well-informed opinions about where the market is going, and get you to more or less commit to a prediction yourself. They can then say, quite honestly, "well, if that happens then X will be a good investment, so let me sell you some X." Since they haven't made the prediction themselves, you can't hold them accountable for its accuracy. 3) "2/10 yr. inversion has correctly saged a recession 7 times in a row since 1969." 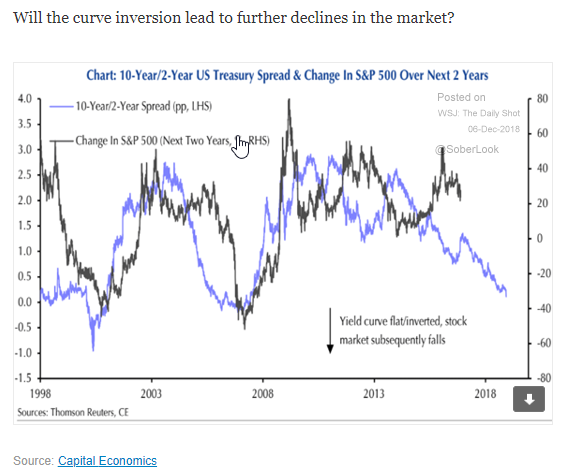 Much the same can be said of the so-called "HIndenburg omen," and as with the Hindenburg omen I find it very interesting that there are so many different and inconsistent definitions of exactly what an "inverted yield curve is." Why 2/10? Don't you suspect that the writer checked at 1/5 and 2/20 and 5/7 and 7/30 year inversions to see what was best, before settling on 2/10? 4) In order to be valuable, as in dollars, predictions need to be time-limited--the timing is the most valuable thing about the prediction--and accurate both ways. "Sooner or later a crash is coming and it may be terrific" is not actionable, no matter how well it would have worked in 1929. "But how do we know when irrational exuberance has unduly escalated asset values, which then become subject to unexpected and prolonged contractions as they have in Japan over the past decade?" in late 1996, induced me to cut back my stock allocation somewhat, three years too early. The value of (partly) avoiding some of the hit in 2000 was just about balanced by the loss of value in (partly) missing out on three years of wonderful gains. "Presidents elected in a year ending in zero die in office" was accurate seven times in a row, 1840-1960 inclusive, and of course people have attempted to add "assassination attempts" in order to extend it to include 1980 and 2000. I'm sure we will be hearing about this in 2020. 5) I've been quite surprised just how often it occurs that "good investments if X happens" turn out not to be particularly good investments when X really does happen. Even more by how often it turns out when you check the record that they were not even good investments when X happened in the past! I once saw an article once that specifically named three dividend stock ETFs "to help you sleep well at night" that "offered downside protection in a crash," all three of which had actually declined more than Total Stock during 2008-2009. I do not disagree. The general wave of deregulation, including the gradual abolition of Glass-Steagal. My point though was that the 2008 recession was not caused by Central Bank tightening. This is the world of what Paul Krugman called "the post modern recession" (present in 2000 & 2008, also 1990 came at the end of a period of wild financial speculation and fraud (the former: junk bonds, the latter: the S&L debacle). In which the conventional story of Fed tightening causing a recession just is not the causation - or at least is only one factor. Instead it all feels very 19th century, thinking the 1872 (?) crash, of wild speculation then collapse. The argument that monetary policy caused the 1929 Crash I think is quite weak. Similarly Ben Bernanke's assertion that bad monetary policy turned the Crash into the Great Depression does not seem so strong now that we have experimented with extremes of monetary policy looseness and found its limits in terms of stimulating the real economy. I might subtitle it "come back, Bank of Japan, all is forgiven" . I think all sides would claim they are "striking a balance" . It is, in practice, a very difficult thing to achieve. In fact you really only know when you have failed to strike a balance - ie when you have a crash . I’m not his PR guy so no idea what all he looked into. Also: he was clear about returns from the time of inversion and not retroactively from the beginning of a recession. So if this is the sort of environment we're in would it be a bad time to put into vanguard BND or total bond funds? Should we instead be investing in short term or holding more 'cash'? The last time they came together like that was around end of Jan-2006 or Feb-2006. I think the recession started in Dec-2007. Recession in how many months? 21 Months? I tried to overlay the two but could not see how to do it. Just click compare (circle with +) on US03MY and add the symbol US10Y. Then select Scales and uncheck Percent. Anyone know how to work tradingview.com ? Later: Right at this moment the 3M is 2.46 and 10Y is 2.45. The 10Y is below the 3M. Last edited by grayfox on Fri Mar 22, 2019 2:11 pm, edited 3 times in total. Year and a half from today... September 2020, just in time for a presidential election. For what it is worth, Fed produced a paper arguing inverted yield curve does not necessarily predict recession, as term premium has been decreasing over time. My natural assumption would have been that term premium increases with low interest rates (borrrowers want to lock in low rates for as long as possible), but that doesn't seem to have been the case. In THAT case it did. How do you extrapolate a general law from a single example ? Or is there a theory behind, that a single observation confirmed ? All of this measurebation has me thinking I should just stand here. It looks like more than a single observation. At least the last three recessions were preceded by an inverted 10Y - 3M. Fred 10-Year minus 3-Month Select Max. Plus I think there is some theory that explains it. Yes, but was it inverted 1-1/2 to 2 years beforehand also in those cases ? And what about other inversions that did not lead to a recession ? The FRED chart only goes back to Jan-1982. So I can only see three recessions. I could be sooner than later. So, it can be between 8 and 22 months earlier, rather than the original "1-1/2 to 2 years". In fact, it has been earlier than that in two out of three cases. Were those three the only instances of an inversion since Jan 1982 ? If you are long term investor, you should careless on this. If you have a balanced folio, a down market will get you a good chance to buy equity cheap. History proves this again and again. But people still focus on daily events. Stay the course. One thing different between now and 2006, is that the Fed continued to raise until July-2006. This was after the yield curve was inverted. Then they held FFR at at 5.25 for 12 months. And finally started cutting in Aug-2007. I recall Greenspan's Conundrum, and he couldn't explain why long rates would not increase. Then Bernanke said that it was because of a Chinese savings glut. So the inverted yield curve was not signaling a recession. It's different this time, they said. But this cycle, the Fed already stopped raising. Perhaps they will start cutting earlier this time. Maybe they can avoid the recession by taking action early. It seems that the inversion has to persist for a number of months to get a recession. All we can do is watch it for the next few months, and see if the inversion persists or not. This chart from macrottrends shows S&P500 with recessions. Check the box Show Recessions. Then use the slider at the bottom to zoom in on a period. There are recessions and there are bear markets. They are not the same. There can be a bear market without a recession. And there can be a recession without bear market.